There is something unique about coming face to face with a sea turtle, or shark, even if they are behind a thick sheet of glass. There is something perhaps even more rewarding though, about putting your hand into a sea anemone and having it close it's tentacles around your finger, or having a hermit crab scamper across your open hand. Watching the fascination of a one year old as a large fish swims just a few centimeters from their nose is in itself inspiring, equally so watching a three year old climb across the rocks and algae looking for sea anemones and starfish. While we may never get the chance to swim with manta rays, or experience sea turtles in their natural habitats, by seeing them up close, we are able to appreciate their natural beauty and develop an awareness for the necessity of preserving their natural habitats. Even more inspiring is experiencing animals and plants in the wild, listening to the sounds of waves crashing as we explore the nooks and crannies of tide pools for animals and playing with seaweed washed up on the beach. I remember growing up the scarcity of sea otters and their tendency to hold themselves a ways off the beach. Now some thirty years later, the numbers have grown and they venture closer to shore, and maybe even up onto the rocks. 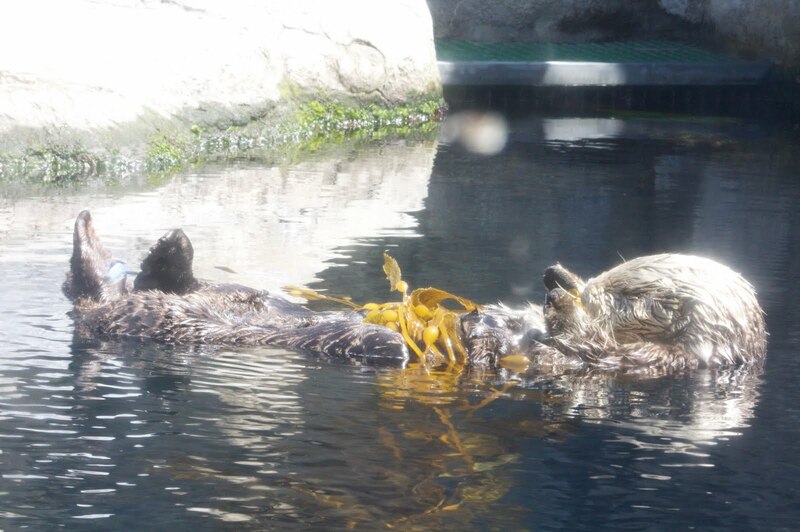 At the aquarium we were able to get close enough to see their furry little faces and whiskers as they swam past just inches in front of us, but watching one the next day squirming to anchor itself in the kelp as waves rolled and tossed was more exciting by far. Hopefully for our children as well.